There is quite a variety of gate designs each homeowner can choose, ranging from classic and simple wooden panels to ornately wrought iron bars. Some care more about curb appeal than privacy, and vice versa, so the variation is quite extensive. Gates are generally used as a means of foot or vehicle traffic control (or both), in different applications, from access control to the parking garage gates. When it comes to the type of mechanism the system will use, there isn't a lot of variation, but rather a few main types. Let's focus on swing gates for the purpose of this post. A swinging gate works similarly to a regular door, supported by strong hinges. That means that this type of system will require a certain amount of space to move either in front or behind its installation location. Many choose to go with a wrought iron swing gate for their driveways because it seems to hold some type of added appeal compared to its sliding counterpart. Perhaps it's a subconscious thing. Naturally, this system can be made out of steel and wood as well, as well as other materials like aluminum or vinyl, for example. Each one offers different pros and cons, so it's really up to you to decide which one best suits your needs. Gate Repair Malibu will happily advise you on this, of course. Apart from the visual appeal, which can be argued (different strokes, after all), this type of system has other advantages over sliding gates. Because it swings on hinges, it can be far quieter, provided that it receives adequate lubrication maintenance and doesn't start to squeak from rust or wear and tear. 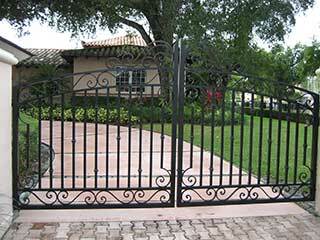 Of course, if you neglect to take proper care of your gate, you'll find that it can become very noisy as well. Because fewer parts are involved (no track or wheels) installing a swing gate is considered easier than installing a sliding one. That's not to suggest that the work itself is easy, but if a comparison is to be made between the two main types, this type of system would probably claim the crown. Of course, a swing gate isn't without some potential disadvantages. The suitable openers this type of system uses are often more complex than what a sliding gate needs, due to the fact that the movement is angeled and not straight. It can also be difficult to install a swinging driveway gate on a slope, especially compared to a system that runs on a track.